If your days of drinking green beer are long gone but you still want to celebrate St. Paddy's Day, take a look at these family-friendly things to do on St. Patricks Day for kids. 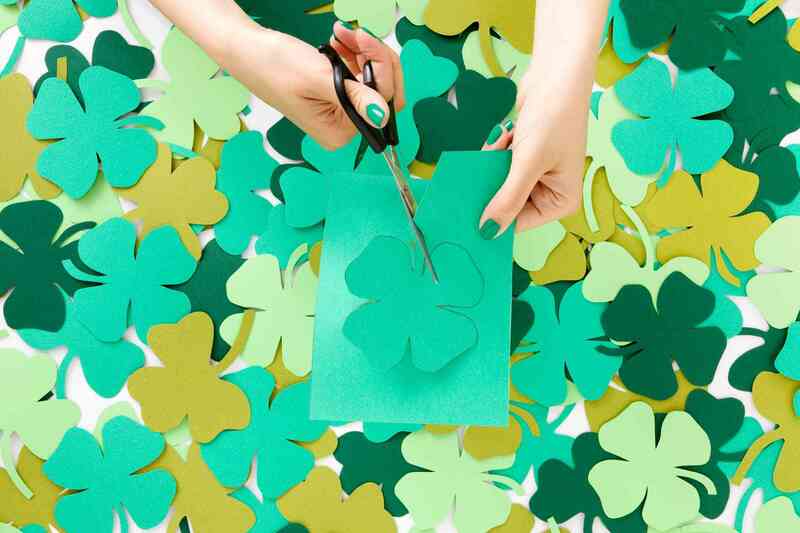 From pretty rainbows to leprechaun-inspired projects, there are plenty of St. Patrick's Day craft ideas are sure to get everyone in the spirit of the holiday. We also have St. Paddy's Day DIY ideas that would appeal to the teens and tweens in your home. Check out your city's site or browse your community calendar for upcoming St. Patrick's Day parades. Wear green—green wigs, green pants, green shoes, green everything—and paint shamrocks and rainbows on your kids' faces. Mid-March can be quite cold in many parts of the country, so bundle up and bring blankets under which to sit. It doesn't hurt to bring a Thermos of hot cocoa, either (consider flavoring it with a minty syrup). Skip the green beer and go straight for the kid-friendly alternative: green ginger ale (just add food coloring!). Or mix up some yummy root beer floats with green ice cream. The little ones will love the sweet, sudsy treat. Serve in clear, plastic mugs so they can show off the green appearance. Shamrock shakes and green smoothies are more options for green, kid-friendly beverages to enjoy! Encourage your child to entice the leprechaun with gold (rocks painted yellow?) and leave a trail of glitter or shamrocks to prove that the magical little man came by. We've rounded up some of our favorite ways to trap a leprechaun to get you started. What holiday is complete without a sweet treat to end the day? You can make basic boxed cake and dye the frosting green, or take it to the next level by making green cake pops. Since rainbows play a role in St. Patrick's Day, how about making some rainbow candies? We've got recipes for marshmallow clouds, rainbow fudge, and rainbow cookies. Other green desserts to consider: sweet green popcorn, pistachio cake, shamrock pretzels and mint chocolate park. And just so you know... authentic Irish desserts aren't nearly as sweet—or as green—as the treats we tend to indulge in in America. Give everyday children's games—like tag, relay races, and hopscotch—a St. Patrick's Day twist! We've rounded up a number of fun indoor and outdoor games to play to help burn off energy from all those green cupcakes. Have the kids help prepare a pot of corned beef and cabbage that has become a hearty, traditional St. Patrick's day meal. Some of our favorite recipes St. Patrick's Day, including an Irish stew and a potato and cabbage dish called colcannon. Set the mood by playing some Irish music in the background. Teach your children about the culture of Ireland, Irish castles or St. Patrick's Day history. Cozy up with a good book about Ireland and St. Patrick's Day. One suggestion is A Fine St. Patrick's Day by Susan Wojciechowski. It's a charming tale with a 6-year-old heroine, and it teaches a good lesson in the end. Start an annual St. Patrick's Day tradition of giving a shamrock plant as a gift. Not only are shamrocks longer lasting than a sack of green candy, but caring for a plant can build self-confidence and responsibility in children.